As promised, here are the specs for the Bed to Beat All Beds. I'll begin at the beginning with the measurements for the Ikea pieces so you'll have everything in one place. 1 6+ foot long 2x6 - this will be for wall supports. A bunch of 3 inch long screws - these will go through the pieces of 2x6 into the studs in your wall, get good quality screws or even bolts if you want the added strength. I tend to go for more smaller screws over fewer bolts because I can handle the screws better than the bolts. 6 8-foot long 2x2s - again, make sure these are straight, they often are not. Let's begin with the platform. I had 2 sheets of a plywood originally 4 feet by 8 feet cut to 96 by 30 inches and 78.375 by 26.375 inches. Please note, this means the pieces meet somewhere about in the middle of the bottom bunk. 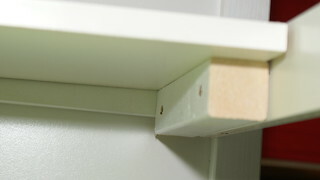 We should have purchased better quality / thicker plywood and since we didn't, we had to put a scrap piece of wood across that joint to make it stronger. Let this be a lesson to you to buy good, sturdy plywood. Please bear in mind you'll loose a little bit because of the saw blade thickness but if you cut for the platforms, you'll find that little bit of loss doesn't affect the slide enough to matter. 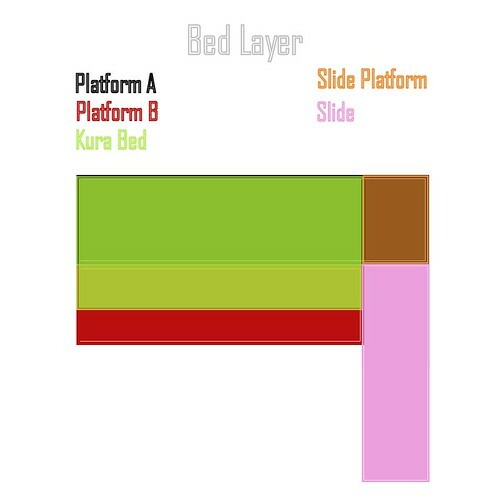 This next diagrams will attempt to show you in layers how the bed area stacks up. NOTE: These are not drawn to perfect scale, I'm just eyeballing it so it is close. This is a bird's eye view . . . if the bird had x-ray vision. 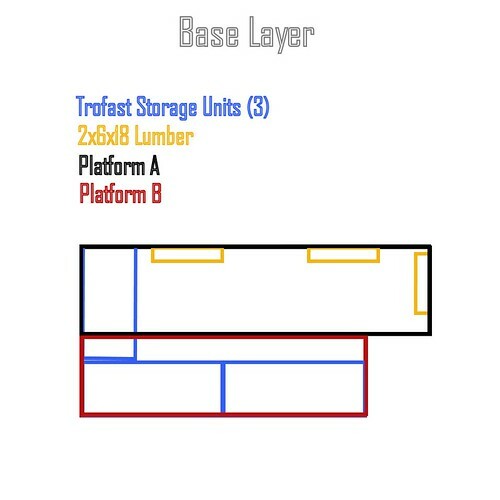 The platforms are supported by three 2 x 6 x 18 cuts of lumber (yellow rectangles) that are screwed into the studs with their tops level with the tops of the Trofast systems (21 5/8 inches high). There are also three Trofast frames in all (blue rectangles). One is set perpendicular to the back wall and the other two are up front parallel to the back wall. The two Trofasts end-to-end measured almost exactly the same as the length of the bed making them an excellent support system. On top of the lumber and the Trofast storage sit the two platforms (black and red rectangles). 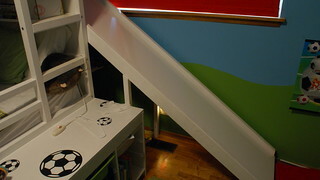 The bed (green) is against the back wall and the front edge sits directly above the back edge of the Trofast storage units (I know the proportions are a bit off here). 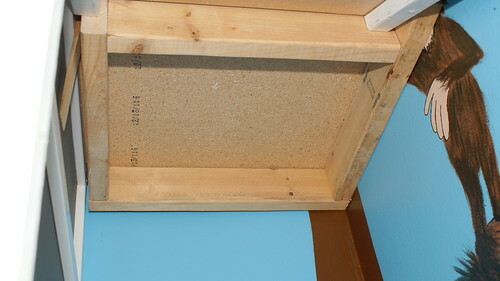 It also sits on a 2x4 frame that is screwed into the studs in the wall. 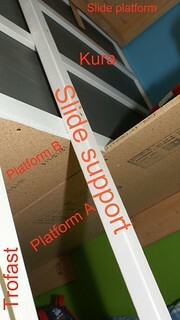 The slide is supported by several vertical 2x2 posts that are cut at the appropriate angle. I wish I could tell you how I figured out that angle but I can't, it wasn't mathematical, it was a lot of marking and cutting (wrong) until I got it right. You can see two of the vertical supports here - one is pretty obvious but the other is against the wall by the nightlight under the slide. Please note - I couldn't put the slide against the wall because the window sill was in the way. Securing the slide would have been a lot easier if I could have just bolted it to the wall studs. The support by the nightlight is actually screwed into a 2x4 that is screwed into the studs. I painted most of that 2x4 green to blend with the wall. 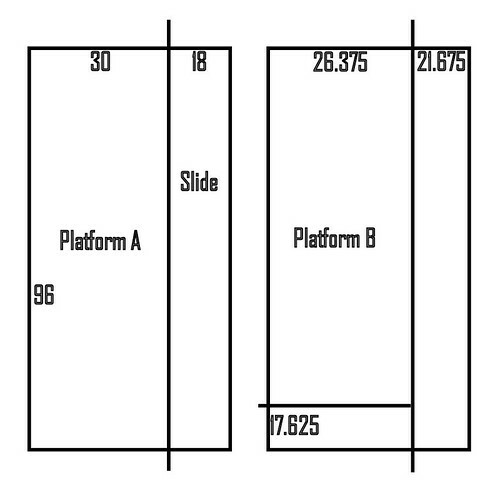 Here's the third vertical support for the slide. This view is from the floor under the slide looking up. The support is screwed into the bed and goes all the way up to the bottom of the 2x4 on one side of the slide and is screwed in there as well. 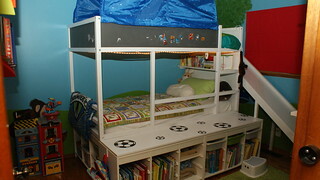 I used lots of 2x2 lumber for support as well as to add bed rails for the lower bunk. I simply measured and cut one piece to be screwed in (angled the screws in from the back) vertically then measured and cut the two front horizontal pieces and two horizontal pieces for the end of the bed as well where we hang his Seattle Sounders soccer blanket. 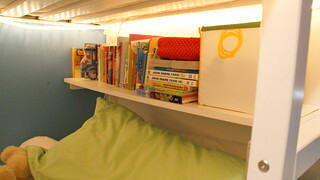 The little bookshelf above the pillows was just some scrap shelving I have resting on supports. 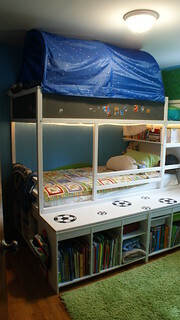 I hope this details out enough for you to create your own Kura bed indoor playground. If you have questions, please leave them in the comments or contact me directly. If I need to add to this post, I certainly can. I wish I had software to draw out better specs but I couldn't find anything to fit my needs that wouldn't have taken weeks to learn how to use. I can provide more photos if you think they would help you better understand the layout. The Kura bed was a great transition bed for him. We set it up as a bunk from the very start although it can be flipped upside down to be a regular height (or maybe even low) twin sized bed. 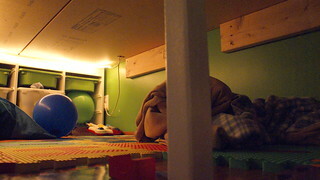 He slept in the bottom area on his crib mattress though which made the transition from crib to big boy bed pretty easy. We did used to find him in the middle of his room a lot though - he was quite the roller. Now I love that he is enclosed up in the top. 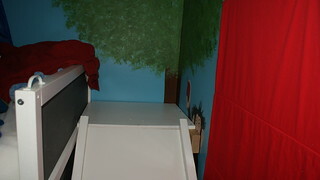 The sides of the bed are nice and high if you buy the recommended mattress which we did. He's safe and loves having such a cool room. He drags everyone back there to see it . . . the latest visitor was the notary who came by our house for us to sign some papers. He was a good sport - followed him right back and oohed and ahhed over his room. This is awesome! 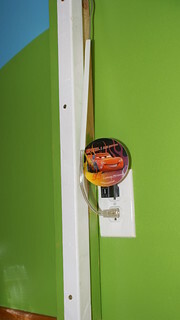 I have been looking for a way to get our Kura up and off the floor and add storage. I never thought of the Trofast system! Unfortunately our kids room has a strange and small configuration so we can't add the slide, but you have given me the inspiration I needed for my project just at the right time!! How is the Kura bed fastened to the Trofast units? It isn't actually secured to those units. Since they are recessed in quite a bit and the bed is attached to the plywood and the plywood is attached to the 2x4s that are bolted into the studs in the wall, I didn't feel that there was any chance anything would move. My crazy little monkey hasn't moved them an inch in the year he's had this setup. Since labor is cheaper outside the United States, a great many of our sheets are made in other countries and imported here. Silk bed sheets full The cotton is been considered as the most famous material for the bedding sheets.